The library is sponsoring a pumpkin decorating contest. 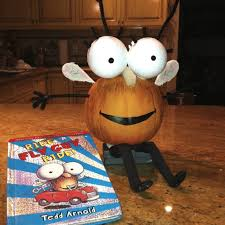 TJE students are invited to decorate a pumpkin like their favorite book character! The majority of the project should be done by students, with a little help from families, and completed entirely at home. Pumpkin Pick-Up… Monday, November 5th by 3:45pm. 1. NO CARVED PUMPKINS! Carved pumpkins will NOT be entered into the contest and will be sent home. 2. Examples of items that can be used to decorate the pumpkins include paint, markers, yarn, fabric, pipe cleaners, construction paper, etc. A craft pumpkin can be used in place of a real pumpkin. 3. Pumpkins should represent a favorite book character. Please provide the book with that character (or a picture of the book cover), if possible. 4. Do not write your name anywhere on the pumpkin. A completed entry form must accompany all pumpkins. 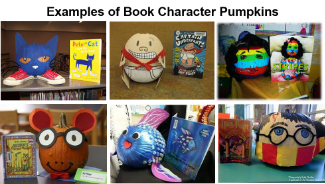 Students will vote for their favorite pumpkin during his/her library time the week of the contest. All entries will receive recognition. The top three winners will receive a prize.